I use nature as an interactive medium and agent to control my instal­lations. My projects look for a new relationship among nature, art, and technology. How we use technology to interact with nature is a subject of great concern to me. In my work, I allow nature to literally control my installations, and by looking at the visualization of the movement of natural surroundings, viewers have an opportunity to achieve a closer connection with nature. One rainy day, while watching the water flowing endlessly down the window, I thought how interesting it would be to express the move­ment and the shape of the water flowing past with light. The result is this interactive installation. When viewers approach the work, water flows over light-emitting diodes (LEDs), and the lights come on when the water touches an LED. The intensity of the LEDs is regulated by the quantity of water running over them. In addition, viewers can par­ticipate by sprinkling water on the surface of the installation, which then turns on the lights. 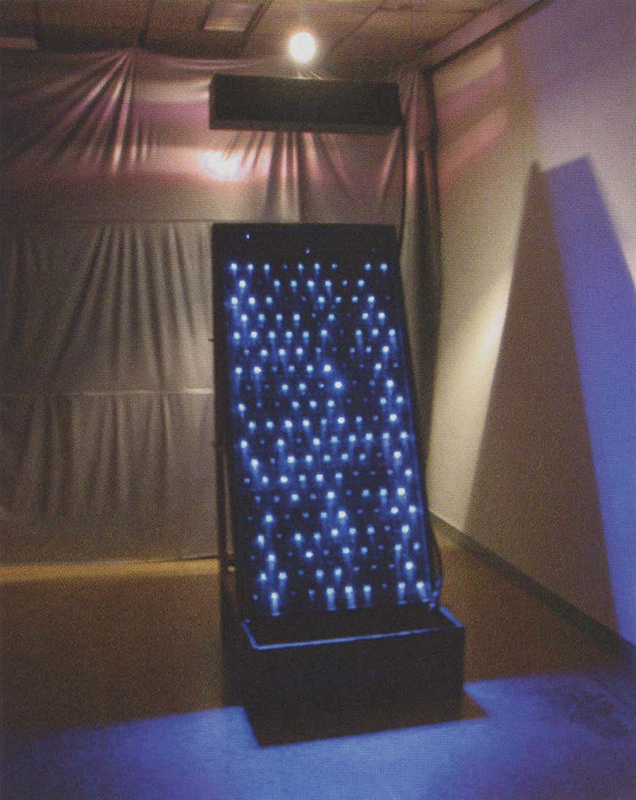 Water Lights was created using the following: Light-emitting diodes (LED, 210 pieces), micro-controller, transistor, and pyroelectric infra­red detector. Although people usually turn on lights with a switch or a sensor, in this installation, lights are turned on by water, which gives viewers a new experience.